BullDog™ and YardDog™ PowerPak™ systems are complete rechargeable portable AC power systems ideal for all types of professional, recreational, outdoor, marine, RV, medical, or other mobile applications. Capable of powering almost any portable AC powered electronic equipment or low ampere tools, it is a perfect solution for portable power needs. Samlex Pure Sine Wave DC to AC Inverter gives direct access to 110v/60Hz AC electricity from an internal sealed gel pack batteries. 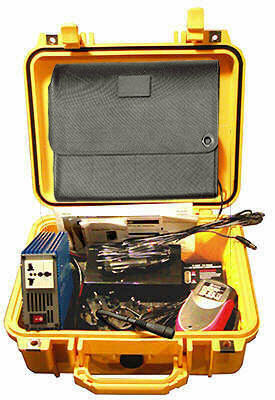 Inverter lets you use portable electronics, household appliances or office equipment on the road. Continuous computer grade 110 volt AC power for sensitive computers and electronics ensures equipment performs at peak. Alternative 300 watt international Schuko 220v/50Hz AC power available by request. P3 Solar durable, lightweight, flexible solar panel is designed to maintain and charge 12 volt DC battery and power most portable electronics. Panels fold up for easy storage in case. Durable: made of extremely flexible and durable CIGS solar cells, a material proven to be very stable and long-lived, even when subjected to the rigors of extreme radiation in space. Offers a higher efficiency than other flexible solar cell technologies. Works under cloudy / rainy skies. Solar Will flex to fit most curved surfaces. Systems can power portable AC electronic equipment for 3-6 hours without recharge depending upon Amps drawn by the portable equipment. 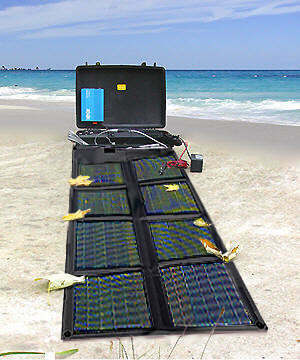 With simultaneous recharge from the solar panel or from a 12v DC cigarette lighter socket in a car, truck, boat, or RV. 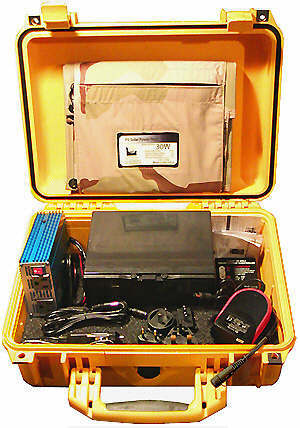 Larger PowerPak™ systems can run most small portable AC equipment drawing up to 2 Amps almost indefinitely. See Battery Life for more specific information. Low Battery alarm alerts you to low voltage conditions, with automatic shutdown if needed, 375watt inverter includes built-in cooling fan. External ON/OFF switch isolates the battery from the output circuitry to ensure maximum battery life when not in use. Everything is built into a super strong Pelican® watertight, dust proof, corrosion proof, hardshell Protector™ case (except Mini-PowerPup™) as listed below. 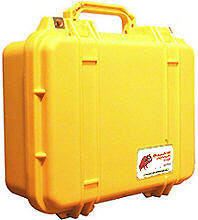 Other case colors available by special order. BullDog PowerPak™ systems can be recharged from solar panel; 12v DC vehicle systems using the cigarette lighter adaptor; or at home, office or travel from any 90-240vAC socket using the 2.0Amp international charger. Built in 12-hour timer ensures the battery is never overcharged. 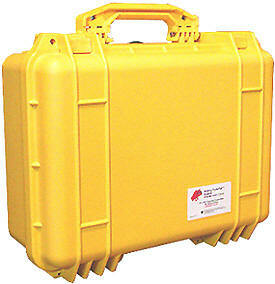 Smaller 7Amp/Hr battery systems use ½ Amp regulated battery charger instead. 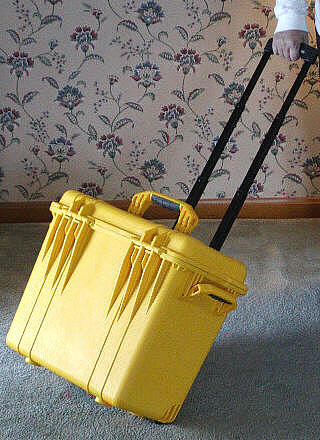 Yellow, Black or Tan case. 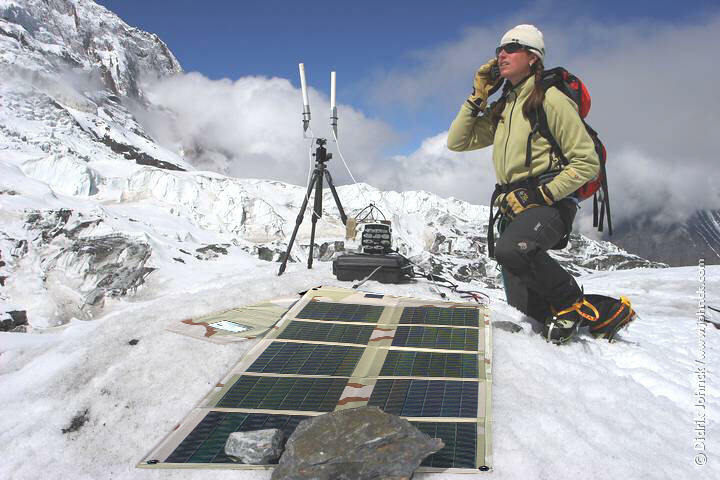 YardDog PowerPak™ systems are AC rechargeable (only) portable AC power systems like the BullDog, but without solar panels or 12vDC connections (Solar panels and 12vDC are NOT compatible with YardDog systems). 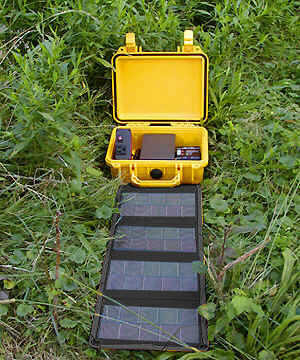 YardDog systems are suitable for all types of outdoor, gardening, marine, medical or mobile applications for which battery recharge from AC power is readily available. Green, Black or Tan case. YardDog Mini-PowerPup™ comes in a rip-stop green nylon carry sack, with an adjustable strap that can be carried over the shoulder or around the waist. Custom versions of both BullDog and YardDog sytems are available with discussion. 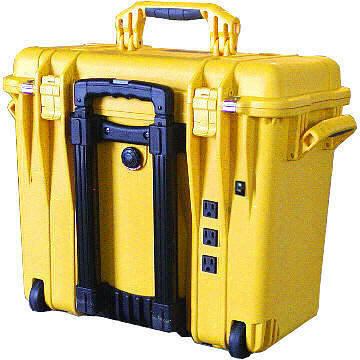 Optional External AC outlets on the outside of the case are available at additional cost. Optional through-case DC power connector available at additional cost (for charging unit with case closed). Available with 220vAC 375watt international output at additional cost. All AC Outlets internal except AirTransport. External AC Outlets and DC sockets available custom at additional cost. External AC Outlets void watertight integrity. Battery power available at or below freezing is severely reduced. 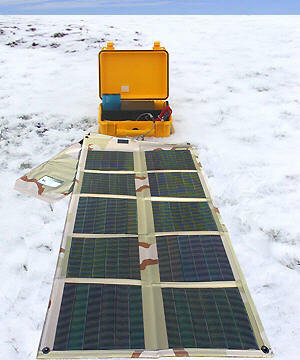 While solar panels will still provide power down to -40ºF (-40ºC), amperes available will be less than required to operate most electronic equipment. Also note that most electronic equipment fails to operate properly below 40ºF (5ºC), consult equipment manufacturer for details. ¹ AmpHr battery capacity is based upon slow draw over 12 hours. Higher rates of Amps drawn cannot be sustained for more than a few minutes at a time. 150watts suitable for equipment using up to 1amp. 375watts suitable for equipment using up to 2amps. 600watts suitable for equipment using up to 3amps. Not recommended for use with equipment drawing more than rated Amps, for a period longer than ten minutes. ² (1) 10amp Schuko, 220vAC/50Hz available. Special direct DC output versions, fully universal international 110/220vAC versions, timer control, special input, vDC/AC only, multiple solar panels, 34AmpHr+ battery power and other specialty custom versions available. For airline carry on restrictions, see Airline Carry On Rules . Safe NiMH rechargeable, durable, long-life battery packs for specific DC power requirements. Recharge by solar, 12vDC, or 110/220vAC adapter. Specify equipment to be supported, volts DC and AmpHrs needed. © 2015 GeoData Systems Management Inc.
BullDog™, YardDog™, PowerPup™, PowerPak™ and MouseHound™ systems are NOT SOLD to any third party organization for Resale. "Open Bidding" for these systems by any party, organization, or governmental entity is strictly prohibited. Instituting such activity, violates our rights as Sole Source Manufacturer, our contracts, and ultimately USA and international law. GeoData is the SOLE SOURCE manufacturer and provider of these BullDog™, YardDog™, PowerPup™, PowerPak™ & MouseHound™ systems. BullDog™, YardDog™, PowerPup™,PowerPak™ & MouseHound™ are the exclusive property and trademarks (™) of GeoData Systems Management Inc.
For Further Information, Email or Call 440-888-4749 (M-F 9-5 ET) ..